The Goldfarb Center for Public Affairs connects Colby to the world of public affairs and inspires active citizenship to explore creative, interdisciplinary approaches to complex challenges. Through hundreds of events featuring world leaders, innovative thinkers, influential politicians, and cutting-edge academics, the center has set a high standard for public affairs programming at a liberal arts institution. Founded in 2003 with a generous gift from Colby Trustee William Goldfarb ’68, P’00, the center contributes to the intellectual life of the College in varied, significant ways. Through research grants, internship opportunities, and course development stipends, it makes a vital difference in the lives and educational experience of Colby students. On Oct. 27, 2018, David Shribman, editor of the Pittsburgh Post-Gazette and member of the Lovejoy Selection Committee, wrote a moving piece reflecting on the tragic Squirrel Hill synagogue shooting. 2017 Lovejoy Recipient, Alec MacGillis continues to explore the regional inequality in America and its consequences. 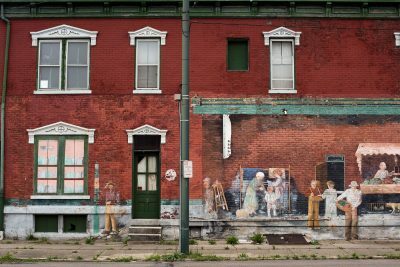 In September he released a piece on Dayton, Ohio, as a companion to the Frontline documentary “Left Behind America” that he spent the past year helping with. The Goldfarb Center coordinates four flagship events. Although each has a unique purpose, all have the goal of providing students opportunities to interact with award recipients and national leaders in journalism, academia, public affairs, and judicial service. The Lovejoy Award, established in 1952, honors a member of the newspaper profession who continues Lovejoy’s heritage of fearlessness and freedom in journalism. The recipient may be an editor, reporter, or publisher who has contributed to the nation’s journalistic achievement. Criteria include integrity, craftsmanship, character, intelligence, and courage. The Cotter Debate Series was established in 1999 to recognize William R. Cotter, Colby’s 18th president, and his wife Linda K. Cotter. The Goldfarb Center brings in top academics from across the country to debate the most pressing and divisive issues in today’s world. The Mitchell Series brings a prominent policy leader to campus each spring for a lecture and a dinner designed to foster interaction with students, faculty, and members of the greater Waterville community while honoring former U.S. Senator, statesman, international negotiator, and Waterville native George Mitchell. The Brody Service Award was created in memory of the Honorable Morton A. Brody, a U.S. District Court judge who passed away in March 2000. Judge Brody led an exemplary career as a lawyer, judge, and civic leader. A long-time friend of the College, he taught courses at Colby on the judicial system and was the husband of former Associate Dean of Admissions Judith Brody ’58.